Note: If you haven't read the general description of our telescopic shafts and clubs here, it is an important foundation for the following information. On our main Telescopic Page, we describe how drivers and putters are the extremes in terms of length, weight, shape, and purpose. The Whole-In-One Adjustable can't do those jobs as well because it is most like an iron. In fact, it is the size, weight, and length of a 4-iron, so it isn't as heavy, large, or short as a wedge. The Adjustable can replicate more than 10 wedge lofts and it is is versatile at close range, but it doesn't cut through thick grass or sand as well as a wedge. This page focuses on wedges for those who want a more traditional feel and performance in their wedge play. They have telescopic shafts, and are also available with one-piece shafts for those who aren't concerned with portability. We offer the following wedge lofts in both right and left-handed, except for the 68-degree which is not available as a leftie. Yes, you read that correctly...our highest loft is a whopping industry highest 68 degrees with NO bounce. 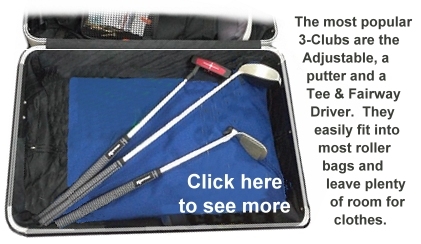 This club allows you to pick the ball off the grass when you don't have much green to work with, take the fringe out of play, and plop it right next to the hole where it stops on a dime...WITHOUT having to "open the face" by rotating the head sideways! It is really fun to play with, but it takes some courage, practice, and skill to use that much loft. Our most popular sand wedge has 56 degrees of loft and 16 degrees of sole bounce. That combination makes it very easy to get the ball out of the sand without sculls, chunks, or flyers. With this model, you can hit down into the sand well-behind the ball and let the sole bounce and loft launch the ball out of the sand WITH BACKSPIN and stop it next to the pin. "I love my new Divnick Wedge. I can take the rough and fringe out of play and stick it right next to the pin. My wife should be jealous!" I have always struggled out of the sand with my 52-degree Cleveland. Now I know why. It only has 6 degrees of sole bounce that seems to dig into the sand too aggressively. I have to hit the sand perfectly to get the ball out when I have a normal lie. But when the lie is poor, or when I have to carry a lot of sand or green, I never know how hard to swing or how far back from the ball to make contact with the sand. But with your 56-degree Divnick Wedge with that miraculous 16 degrees of bounce, I can trust my instincts a lot more easily. I actually aim to hit the sand twice as far back from the ball as before (about 4 inches total), and it increases my margin of error so I almost NEVER mis-hit. My buddies think I went to a short game golf school. Thanks for designing a club for my imperfect swing and aging bones! Length: Our standard Wedge length is 36 inches (91.4cm). Custom lengths are available upon request. See our satisfaction and lifetime warranty here. The normal cost for our Divnick Wedges is $169 with a two-piece telescopic shaft, minus $20 if you get it with a one-piece steel shaft. Special April Discount: Until the last day of April , you can get Divnick Wedges for a $30 discount which takes the price down to $139 ($119 for a non-telescopic shaft). And we take another 10% off if you order 3 or more clubs! Call: If you prefer to order by phone or have any questions, please call 1-937-985-5863. Hours are 9:00 am to 9:00 pm Eastern USA (same as New York Time).